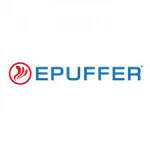 Epuffer is a brand that features a number of different e-cigarette and portable vaporizers. These are battery-powered devices that can be found in a number of different categories and types. In terms of e-cigarettes alone, you can find several products under their magnum line. You can also find several options for disposables in their ECO series. E-cigars, e-pipes, and even e-hookah products are available in several different forms. This includes a number of different starter kits for the e-cigarettes, e-pipes, and e-cigars. E-liquid can be purchased through this brand’s website, and you can also find a variety of different accessories and spare parts.